We stock all makes and models of thermal overload relays. 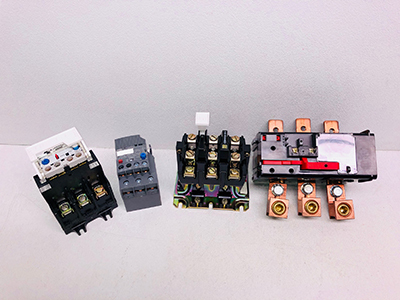 From current model series to ones dating back to the earliest days of motor control, we can supply you with the exact replacement overload relay, accessories, and motor thermal protection you need to keep your motors running smoothly! Our motor control experts can also spec new retrofit relays that connect to your original motor starter to better protect your motors and provide a solution for aging and obsolete systems. 193-EC1BB OVERLOAD ALLEN BRADLEY SOLID STATE RELAY, INTEGRATED I/O 2 INPUTS 1 OUTPUT, 3-15A RANGE. DEVICENET READY. WE CAN UPGRADE AND RETROFIT ANY EXISTING ALLEN BRADLEY RELAY AND MCC BUCKET WITH DEVICENET AND ETHERNET/IP COMMUNICATION. 9065SF120 SQUARE D MOTOR LOGIC OVERLOAD RELAY, SOLID STATE, 9-27A RANGE.